November STEM inventions were incredible! We saw the most amazing things some of which including: a gumball machine that plays music, a gnat trap, a pen holder, a guitar, a robot pencil holder, a nightlight, an egg carton waste basket complete with a built-in air freshener, and more! We were blown away with how well these turned out! We cannot wait to see the gifts our scholars make for December monthly homework due December 22nd! We will be reading the story “Animal Babies in the Grasslands.” The story will look at animals that live in the grasslands! We will be discussing Main Idea, working with initial and final /p/, and learning about adjectives. As we finish up counting and writing numbers 11-20, we will be moving onto counting numbers to 100! We will start with counting to 30, then skip counting to 100 by 10’s. It will be the first time we are going to use a hundreds chart! Please note: students should still practice finding 1 and 2 fewer. Be sure to get some extra practice at home! An easy way to incorporate this at home is during dinner prep or at the grocery. For example, “I have eight apples, but I need 2 more (or 2 fewer). How many will that be? Can you do that for me?” This will help make Subtraction and Addition much easier later in the year! Students will begin exploring the water cycle and using vocabulary terms including precipitation, accumulation, evaporation, condensation. – Homework is due on FRIDAY each week and returned the following Monday. -December STEM homework is DUE December 22nd. – Please read regularly! Remember that just 20 minutes a day can boost your child’s reading levels! – Please remember to send an extra pair of uniform clothes to keep in your child’s cubbie at school in the event of accidents or spills. – Uniform is enforced daily, including uninterrupted black shoes. Please go to http://cmitelementary.org/uniform-policy/ for more information. We will continue exploring the story “Dig, Dig, Digging!” Along with the story, we will be reviewing classifying and categorizing. We will also be identifying initial and final /T/. We will continue comparing and ordering numbers through 10! Students will continue exploring the Earth and sky. – Homework is due on Friday every week. -STEM Homework directions (separate from the school wide STEM fair) have been sent home. These projects will be due 11/30/2017. -Parent conferences will be held 11/10/2017. Please sign up with your scholar’s teacher via Signup Genius. -Please encourage responsibility for belongings. We will be reading the story “Dig, Dig, Digging!” Along with the story, we will be reviewing classifying and categorizing. We will also be identifying initial and final /T/. We will begin comparing and ordering numbers through 10! Students will begin exploring the Earth and sky. -Please send a small or medium pumpkin for your child to decorate as a character from their favorite story. Pumpkins will be on an art display! -STEM topics need to be turned in to classroom teachers. We will be reading the story “Miss Bindergarten takes a Field Trip with Kindergarten.” Along with the story, we will be learning how to classify, categorize, and identify nouns. We will also be reading and writing letters to Z, as well as focusing on identifying beginning sounds of words. We will continue identifying, reading, writing, and comparing numbers to ten. We will be wrapping up our unit on motion and moving into Earth and space science! -Please send an extra uniform for scholars to keep at school. Accidents happen! – Please be sure to label all personal items and also reinforce responsibility with your scholars. Last week we learned about respect and what it looks like and sounds like in different settings. Although we completed our lessons on respect, and we will now be focusing on a new character word, we will continue to encourage and highlight respect throughout the year. We wrapped up our unit on problem solving in science as well as our unit on counting, comparing, and ordering numbers to 5! We will begin focusing on cooperation! We have some very fun and challenging team building activities planned! We will be reading the story “Plaidypus Lost.” Along with the story, we will be continue to learn about setting, syllables. We will also be naming, sounding, writing letters to S.
We will be counting, comparing, and ordering numbers to 10! We will begin our unit on motion! – MAP testing is now complete… Stay tuned for scores. Good luck in first grade, Tigers! Thank you to all the parents that completed the promotion survey. Based on the responses, Kindergarten students are being asked to wear all White Dresses (Girls) or White Button down long sleeve shirts with Khaki Pants (boys). The theme will be “Oh, to First Grade We Will Go.”As a reminder, the promotion will be held in the cafeteria on Wednesday, June 7 from 8:30-10:00am. Tickets will be sent home on Monday, June 5 based on the survey responses. Remember, tickets should include siblings that are in the building. This will act as their pass to leave class. Thank you to the parents that volunteered their time and joined us on our field trip last week! It was such a unique experience for the students, enjoying Dr. Seuss stories in a different medium! We will read the story “Old MacDonald had a Workshop.” It is about a twist on a classic story! This is a fantasy text that will be looking at character and setting. We are learning about time! What you can do at home: Have students try to figure out what time it is, give them a time that you need to leave and have them be “time keeper,” or practice counting by 5 to 60 to show the minutes on a clock. 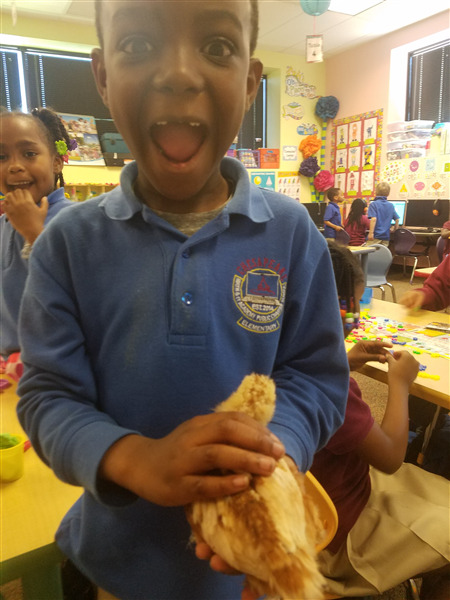 Kindergarten welcomed 12 baby chicks this week! We will have the chicks in our care for just one more week before they go back to their home at a farm! It has been such a great journey and wonderful learning experience! – Homework is due on FRIDAY each week. Remember to bring sight word journals every Friday. Homework that is not submitted by the due date will be given a ZERO. – Please read regularly! Remember that just 20 minutes a day can boost your child’s reading levels! Reading logs are due at the end of the month and will be given a zero if blank or missing from your child’s folder. The words for this week as as follows: of, are, that, do, one, two, three, four, five, here. Sight Word Notebooks can stay home until Friday. As a reminder, the promotion will be held in the cafeteria on Wednesday, June 7 from 8:30-10:00am. Tickets will be sent home on Monday, June 5 based on the survey responses. Remember, tickets should include siblings that are in the building. This will act as their pass to leave class. If you need to make changes to your ticket count, please contact Ms. Santiago at jlsantiago@cmitelementary.org and we will do our best to accommodate. We will read the story “Building with Dad.” It is about a boy who joins his dad at a construction site! This is a realistic fiction text that will be looking at character and main idea. Our butterflies will soon be released! Additionally, we will continue observing the changes of both the egg and the baby chicks over the 2 weeks. Just one more week until our eggs hatch! Kindergarten has finished their first week with our baby chicks and eggs! 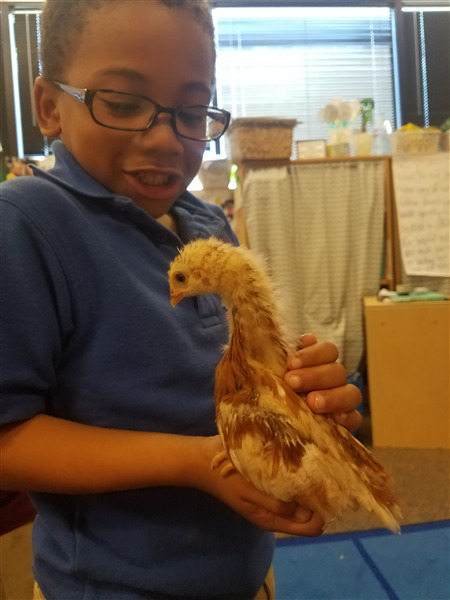 Over the last week, students were able to interact with the baby chicks. They are showing rapid growth already! Additionally, students learned about a embryology method called, “candling” where a bright light is shined through the egg in order to see what is inside. The students were able to see the heart and vessels of the future baby chick! It has been a fun and interesting learning experience for both the teachers and the students. We can’t wait to see what unfolds over the next 2 weeks! The words for this week as as follows: like, he, for, me, with, she, see, look, they, you. Sight Word Notebooks can stay home until Friday. We will read the story “This is the Way We Go to School.” It is about different ways children get to school all over the world! This is a realistic fiction text that will be looking at character and main idea. We are learning about money! We will identify different coins and their worth. Additionally, we will be counting money and closing out with determining if we have enough money to make purchases! We will continue observing the life cycle of a butterfly in real time! Students will watch as our classroom caterpillars go through the metamorphosis stages to become a butterfly. Additionally, we will continue observing the changes of both the egg and the baby chicks over the next month, until the egg hatches.